Bittersweet Enchantment: The Airship Racing Chronicles by Melanie Karsak | Guest Post (All About Steampunk) + Giveaway! 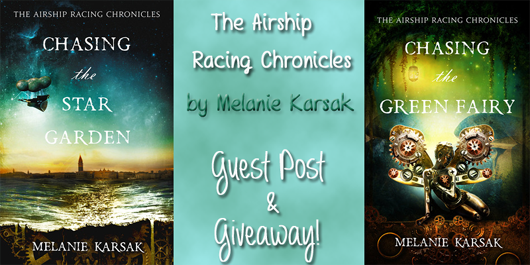 The Airship Racing Chronicles by Melanie Karsak | Guest Post (All About Steampunk) + Giveaway! An opium-addicted beauty.An infamous poet living in self-imposed exile.An ancient treasure about to fall into the wrong hands. 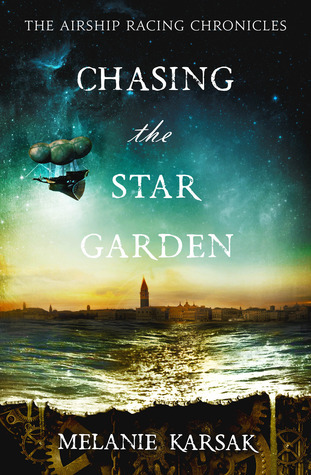 Melanie Karsak's Chasing the Star Garden takes readers on a thrilling adventure from the gritty opium dens of gaslamp London to the gem-colored waters of the ancient world. Lily Stargazer, a loveable but reckless airship racer with a famous lover and shattered past, reluctantly plunges into a centuries-old mystery in a romantic adventure best described as Dan Brown meets Mary Shelley. Pulled head-long into the ancient secrets of the realm, Lily soon finds herself embroiled in Celtic mysteries and fairy lore. And she’s not quite sure how she got there, or even if she wants to be involved. But Lily soon finds herself chasing the spirit of the realm while putting her own ghosts to rest. And only accepting the truth--about her heart and her country--can save her. *Due to steamy scenes and depictions of drug use, this novel is intended for mature readers. What the heck is steampunk? Is it science fiction? Is it alternative history? Is it fantasy? Is it dystopian? Is it goth with goggles? Give the rise of steampunk literature and all the new, fantastic steampunk books coming on the market, some readers might be wondering: what is steampunk and will I like it? Yes! You’ll love it! If you are looking for your first steampunk book, you are in luck. Steampunk has something for everyone. Steampunk works can be science fiction (where Amazon houses steampunk), fantasy, romance (often called gaslamp), or dystopian. You will find steampunk books in children’s, YA, adult, and erotica. More than a genre, steampunk is really an aesthetic. Steampunk is the “feel” you get from a setting. From rule-defying heroines, ruthless air pirates, tea-drinking submarine captains, adventures to exotic locations, treasure hunts, steamy scenes, clockwork inventions, bustles, and goggles (there must always be goggles, they are like the perfunctory sword in sword and sorcery) all these things make up steampunk. As a literary genre, steampunk is usually set in one of the following times/places: Victorian England (or there-about) such as in Emma Jane Holloway’s The Baskerville Affair Series, a dystopian future such as in Megan Curd’s Iron Lily, or the weird west such as in Mike Resnick’s The Doctor and The Dinosaurs. But there are no limits. 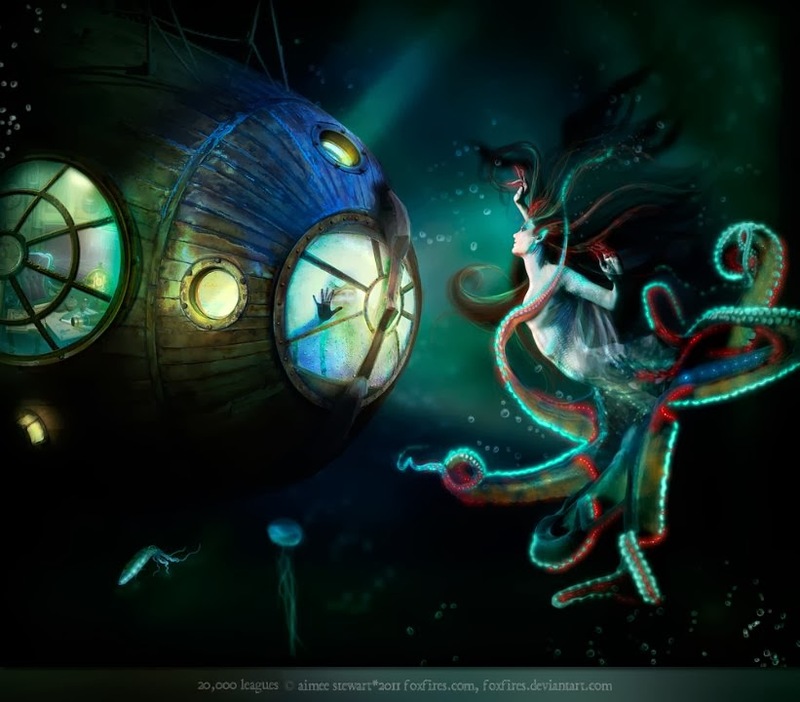 Like “paranormal” stories, steampunk stories can be set at any time. Steampunk literature is traditionally thought linked to Victorian Science Fiction, stemming from Jules Verne rather than Tolkien, rewriting history without the diesel engine and a focus on steam power—thus, the steam in steampunk. That said, if you find a novel like Karen Kincy’s Shadows of Ashpodel set after the invention of the diesel engine, these works are called dieselpunk. If stories are set before the advent of steam, they are called clockpunk. But why is steampunk becoming so popular? Steampunk recaptures mystery and the spirit of adventure. Before ancient alien theories, the great pyramids held real mystery. Steampunk allows us to escape into an adventure Phileas Fogg style with the gusto of Indian Jones by transporting us to exotic locations that are now commercialized, inaccessible, or commonplace. A. W. Exley’s The Artifact Hunters series are a great example. Can you imagine the excitement of exploring the pyramids for the first time? Steampunk takes us back to a period when we were first rediscovering our ancient world. The mysteries of our past were still that: mysterious. Now we flop down on the TV and watch a National Geographic special on mummies because there is nothing better on TV. Steampunk puts the allure of discovery and adventure back into a world where most mysteries have been tapped-out. Steampunk promotes beauty and uniqueness. 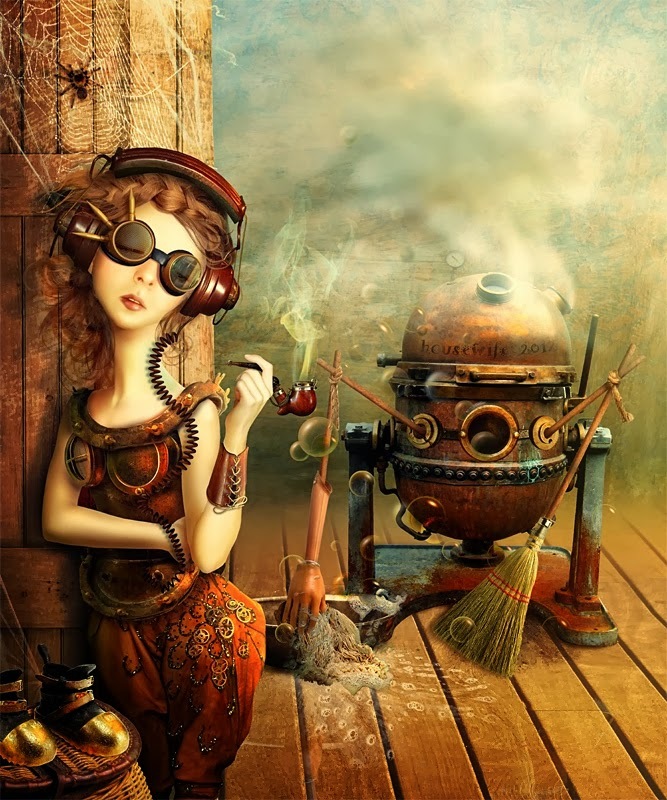 Steampunk is not just a literary genre, it is also a lifestyle! There is something beautiful about steampunk. From the clothing to the graceful airships, steampunk envisions a world that is beautiful. In terms of clothing, steampunk attire ranges from silk gowns with bustles to short-shorts with bodices, from top hats and canes to mad-scientist lab coats and goggles. The material used to make steampunk clothing, silk, lace, and leather, are textiles that we don't regularly employ (save our sneakers) in our everyday lives. Much of what we wear is mass-produced. We have no idea where our jeans and t-shirts come from or under what conditions they were made. Steampunk clothing is often made by the wearer themselves. The use of rich textiles over mass-produced polyester appeals to our tactile and visual senses. Steampunk environments embrace fog over smog. We are sick of our environment, and our environment is making us sick. Why do we envision worlds powered by something other than fossil fuels? Regret. Steampunk allows us to envision worlds where we do not make poor choices that will cause permanent damage to our environment. In the case of dystopian greenpunk, we often see the return to the green world after the collapse of our fossil-fueled environment. Steampunk allows us to acknowledge wrong turns and encourages us to imagine a historical "do over." Steampunk is smart and brazen. Steampunk encourages us to be our better selves. It encourages the Lovelaces and Babbages of the world to carry on with genius ideas ahead of their time. It encourages Victorian (or Georgian, or Edwardian, or American Western) heroines to slip on a pair of trousers and defy every norm of the era--because those norms were silly. And so doing, it makes us question our own societal values. Steampunk encourages readers (and writers, tinkers, thinkers, etc.) to consider what might have worked better. What if we had designed x with y instead of z? Steampunk makes us smarter, and the "punk" of steampunk encourages us to question historical norms in light of modern values. These are some of the main values promoted by steampunk: mystery, adventure, beauty, uniqueness, environmentalism, intellectualism, and moxie. It's no wonder steampunk is increasingly popular. It's not all goggles and gadgets. 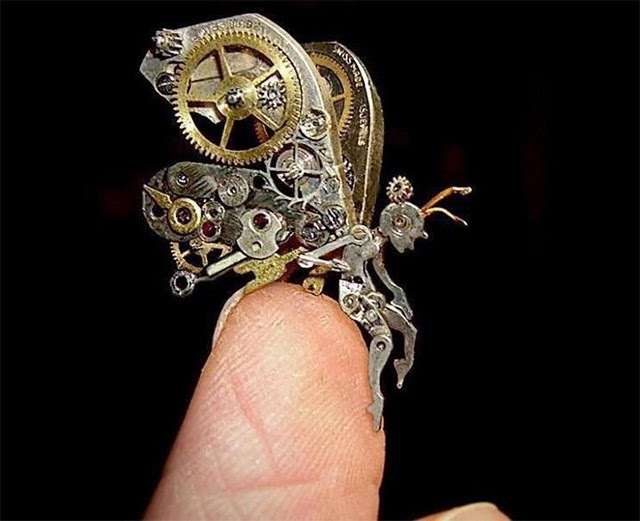 As anyone in the steampunk movement can tell you, there is a reason behind all those cogs. Steampunk says something important about how we feel about our world. Maybe re-envisioning the past or creating a new vision of the future sheds light on today's social problems. All art teaches us about life. What does steampunk teach you? To Enter: Please use the rafflecopter form below. Prize: 1 ebook set of Books I & II of The Airship Racing Chronicles. 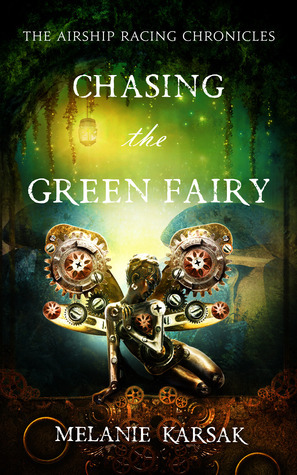 This would be Chasing the Star Garden (I) and Chasing the Green Fairy (II) (releasing March 4th). Please note that these books are adult novels for mature readers. Yes, I have. They are pretty good. Thanks for stopping by, Kai! Thank you for the lovely post. I was wondering what "greenpunk" was. When I saw the reference, it didn't have the dystopian in front to help define it. I've read steampunk novels and love the extra creativity the authors bring to the table. It takes a certain type of extraordinary brain to successfully include the elements needed in a great steampunk novel. Melanie has that type of brain. Hi Michelle, Greenpunk is a new subgenre of steampunk and can be seen as the mix of nature and man-made. It is an emphasis on the marriage of the green and the mechanical. I would argue that a work like Megan Curd's Steel Lily is greenpunk. It can be dystopian or set in alt history . . . like if we used today's environmentally friendly sources of energy in the Victorian period. I haven't read many, but I have enjoyed them. Sorry No I haven't read any steampunk books yet I heard great reviews about them but I haven't had a chance to one one yet but this one looks and sounds great thanks for the awesome giveaway! We are all over the map in terms of heat, adventure, and scifi elements. Try a couple and see what you like :) Good luck in the giveaway! I haven't read any steampunk books but after seeing this post I absolutely will! Starting with these books. WOW!!! Absolutely gorgeous covers. I'm so super duper intrigued now, so THANK YOU! I have read a few Steampunks. The Iron Codex series by Caitlin Kittredge. The Immortal Empire series by Kate Locke. And a few others. I love it. It is one of my favorite types to read. And this series just sounds delicious! Thank you for the great giveaway!